HP 538696-B21 PCI Netwerkkaart kopen? | That's IT! Professionele, door Intel voor HP geproduceerde PCI-Express x4 4-kanaals server-netwerkadapter. Deze adapter is een low-profile model met alleen een full-height bracket meegeleverd en dus geschikt voor gebruik in systemen die over volledige hoogte uitbreidingssloten beschikken. In today’s resource constrained environments, there is a predominant need to simplify infrastructure, improve manageability, optimize network performance and lower the cost of computing. The NC375T helps achieve performance scalability for consolidated server environments at an optimum price. 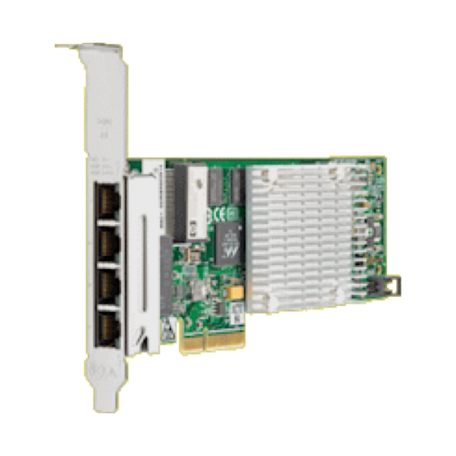 NC375T offers four 10/100/1000T Gigabit Ethernet ports on a single card, saving valuable server I/O slots for other purposes. The NC375T is a low-profile card with both full height and half height brackets included in the kit and its x4 PCI Express interface is compatible with x4, x8, and x16 PCI slots. All HP ProLiant networking options undergo vigorous testing to ensure full compatibility with ProLiant Servers to meet exacting HP quality standards. The NC375T provides full driver support on a wide variety of ProLiant servers.